McDonald’s continues to make changes to its product in response to customer-driven initiatives. using fresh rather than frozen beef and cooking to order for Quarter Pounders. 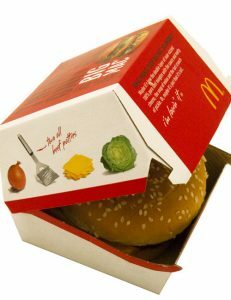 removing artificial ingredients from Big Macs, Chicken McNuggets, and Egg McMuffins. Now, almost two-thirds of McDonald’s burgers and sandwiches in the United States will contain no artificial flavors, no artificial preservatives, and no added color. To accomplish this goal, artificial preservatives were removed from American cheese, Big Mac’s Special Sauce, and many hamburger buns. Other initiatives include sustainably sourced McCafe coffee by 2020, and cage-free eggs by 2025. McDonald’s is also looking at beef from producers that follow sustainability programs. This post is based on the Food Bev article, McDonald’s to remove artificial ingredients from its burgers, by Martin While, September 28, 2018; the McDonald’s press release, McDonald’s USA Reveals Changes to its Classic Burgers, September 26, 2018; and the YouTube video, McDonald’s removes more fake ingredients from menu, by Bloomberg Markets and Finance, September 27, 2018. Image source: © McGraw-Hill Education/Mark Dierker. 1. What is driving this change? Guidance: McDonald’s is obviously feeling the pressure from customers for products made from “real” ingredients, and for ingredients that are sustainably sourced. Competitors like Panera Bread and Chipotle emphasize the use of fresh ingredients. 2. What operations problems could this present? Guidance: This creates a tremendous supply chain management problem, impacting 14,000 U.S. restaurants. They must change how items like buns are made. The removal of artificial preservatives will reduce their shelf life placing an emphasis on more frequent, quicker deliveries. Another consideration is how the products are cooked. McDonald’s in their Made-For-You system redesigned the bun to allow for faster toasting to cut down on the assembly time. Does the change in the bun’s ingredients require adjustments or replacement of equipment? Will it take longer to get your order at a McDonald’s? Inventory management also becomes important. The shelf life of the components are reduced. Shorter shelf life coupled with low margins in the industry makes inventory management critical. Another consideration is that forecasting takes on a greater role. Better forecasts can make inventory management easier. 3. How might these changes impact McDonald’s? Guidance: Obviously, McDonald’s is hoping that the change to “real” ingredients will draw in a larger market and boost its sales. However, consideration should be given to the potential for added cost in the supply chain. Removing artificial preservatives will encourage more frequent, quicker deliveries that could add cost. Reduced shelf-life will result in more wastes—increasing cost. Changes in making the food—possibly increasing production time—could add costs. 4. Should McDonald’s raise its prices because it is using “real” ingredients? Guidance: McDonald’s strategy has been to provide consistent quality food, quickly, at a low price. Although the quality might be perceived as better with no artificial ingredients, it will be difficult to raise prices, as low price is one of the main customer reasons for going to McDonald’s.